You are using a business computer. 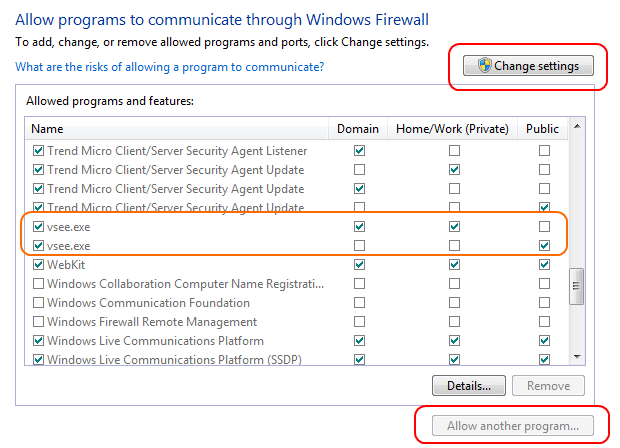 The above criteria are true, you are not able to connect at all, and your computer firewall is not the issue. The above criteria are true, and your connection is poor even though both participants have a strong internet connection. A computer firewall will allow you to log into SecureVideo.com, but prevent your browser from launching VSee when you click Join to Session, or when your patients attempt to enter the waiting room. 1. 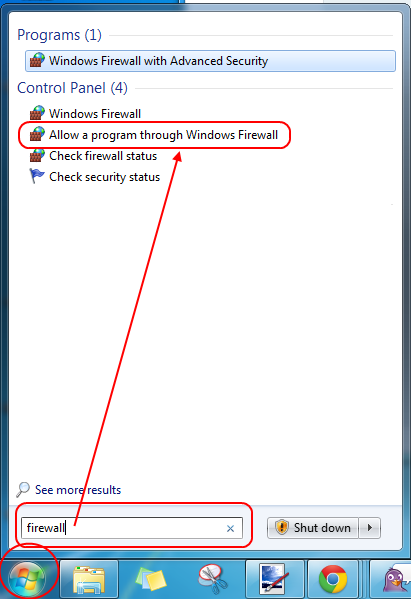 Click on your Start Menu icon in the lower left-hand corner, and in the search field, type firewall. 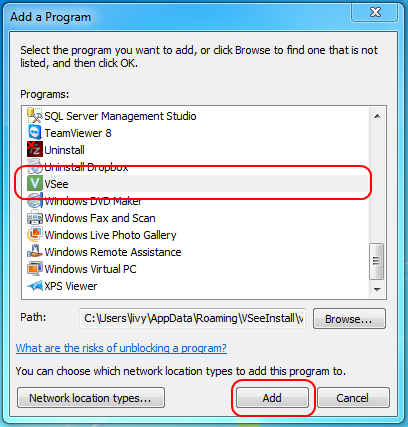 In the list that appears, click on Allow a program through Windows firewall. 2. Check to see if VSee is listed among the allowed programs (highlighted here in orange). and that all three of these columns are checked: Domain, Home/Work (Private), and Public. If VSee doesn't appear in the list or the columns aren't all checked, click on Change settings in the upper right-hand corner, and then you can either check all the columns or click on the Allow another program... button in the lower left-hand corner to add VSee to the list. 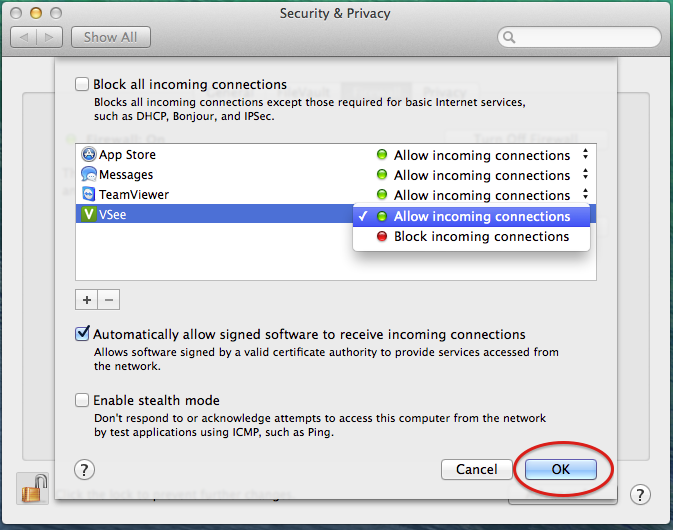 If your settings were already correct, your network firewall may be the cause. Please see here for instructions on contacting your IT team. 3. On the next window, scroll down to the bottom of the list to find and select VSee. Then click Add. 4. On the firewall settings page, click OK to save. 1. 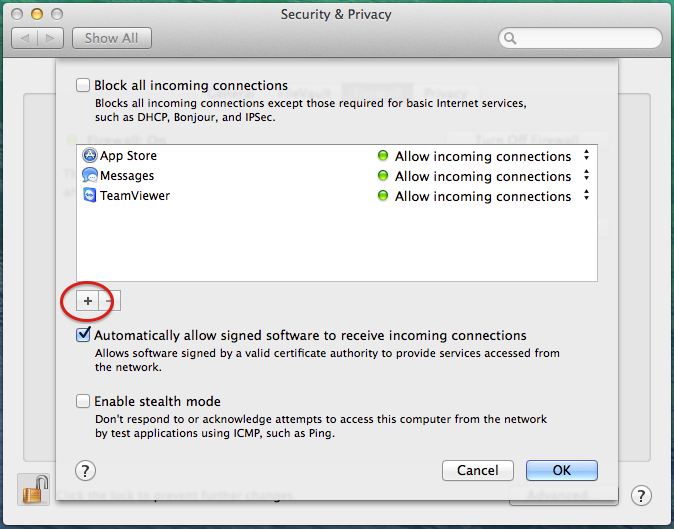 In the upper-left hand corner, click on the Apple icon for the Apple menu, and select System Preferences. 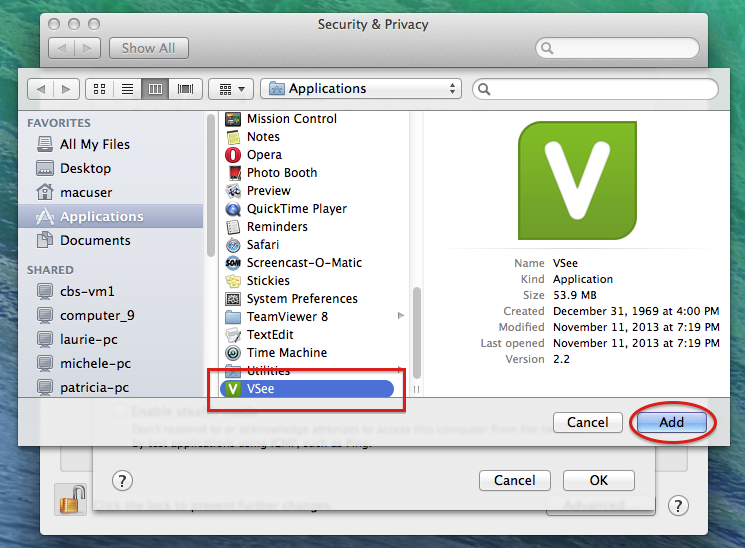 In the window that appears, click on Security & Privacy. 2. Click on the Firewall tab. When the window changes, click on the lock icon in the lower left-hand corner, and the Firewall Options... button will become clickable. 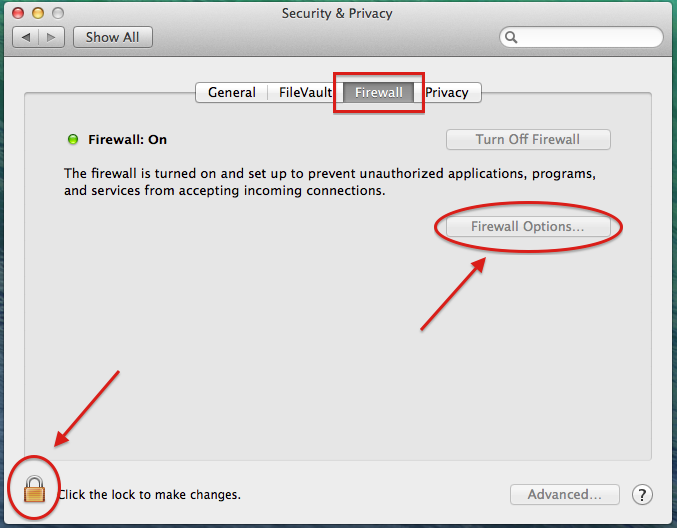 If your computer firewall was NOT on, your network firewall may be the cause. Please see here for instructions on contacting your IT team. 3. On the next screen, click on the + (plus) sign to add another program. 4. Scroll down until you see VSee. Select it, and click Add. 5. Make sure the list says Allow incoming connections. (Click and select that option if it is not already set.) Then click OK, and your settings should be saved. I am trying to use a web-based service called SecureVideo, which uses a third-party videoconferencing software called "VSee". I haven't been able to connect successfully, and wanted to know if you could make sure the ports they need are open (or that the UDP timeouts are not so restrictive). SecureVideo's support team suggested that I direct you to this page on their website: https://www.securevideo.com/equipment/firewall-settings (scroll down for the VSee section). If you have any questions regarding that page, please contact them at [email protected], or call them at (888) 540-2829.